Nancy JirtleKnitting a wedding gift for a daughter can be a memorable experience for everyone involved! CyberFibres will describe one such adventure. A positive aspect of fiberwork is that most projects made as gifts can be given whenever the fiberworker completes them. For example, if a knitted scarf intended to be a birthday gift is not finished by the birthdate, it can serve as a Christmas gift instead. The exception to this flexibility is a fiber gift that is meant to accompany a singular event – the best example of which is a wedding. Guests have been invited, preparations have been made, and the bride and groom are to be married on a scheduled date at a precise time in a particular place. In this situation, a needlework gift cannot be finished the night before. The fiberworker must allow time for blocking the gift, adding a label to it, and wrapping it with care. CyberFibres decided to knit a rectangular lace shawl for her daughter to receive at the wedding reception and wear on her honeymoon. A pattern was created by looking at numerous lace knitting stitches and choosing a pleasing arrangement of them for the project. CyberFibres began knitting with a circular needle, but became dismayed to see that the lacey stitches stretched unattractively. Starting a second time, CyberFibres found that straight bamboo needles worked much better with the fine yarn. Subsequently, it was necessary to rip out rows three times to correct faulty stitches that were obvious and marred the pattern. One of these do-overs was necessitated by an unsuccessful attempt to work on a knitted lace pattern while riding a fast-moving train. A portable project when worked with straight needles in a stationary setting, this wedding shawl was stitched on in Durham and Biscoe, North Carolina, USA; Bedford, England; and Banff, Canada. It took four months of time, allowing for other wedding preparations to occur concurrently. With nothing else to do, CyberFibres estimates that the shawl could have been made in 3-4 weeks. 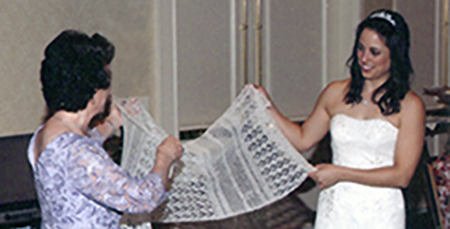 The completed wedding shawl was presented to the bride during the wedding reception, as planned. The bride was thrilled, and wore it on her honeymoon! Why would a mother-of-the-bride intentionally increase the responsibilities of wedding preparations by undertaking a fiber project with a deadline? CyberFibres can only say that this project brought with it a sense of purpose, accomplishment, and relief to cherish always.